Even among Alan Clarke’s skeletal, stripped-down late period films, Christine (1987) is remarkable for its sheer starkness; only the wordless Elephant (1989) is more silent and spare. Christine – which was, remarkably, unavailable publicly in any form before the recent release of the BFI’s box-set of Clarke’s television work – is a film about children who use heroin. Clarke had stated that he wanted to make a film about ‘kids and drugs’, but Christine is far from a straight social-realist drama. Indeed, it’s perhaps one of the most frequent misreadings of Clarke’s work that he was a Ken Loach-style social realist. While the work is absolutely engaged with social issues, Clarke’s style is more in thrall to the theatrical modes of audience alienation practiced by Bertolt Brecht – Clarke tipped his hat most directly to this in his uncategorisable 1982 TV adaptation of Brecht’s Baal, starring David Bowie – and Christine, like much of Clarke’s late work, features a distinct structure and visual style that holds the audience at arm’s length for much of the film’s duration. While Christine was first broadcast in the mid ‘80s heyday of ‘Just Say No’ and Drugwatch, it has little to do with publicly engaged anti-drugs campaigns; as with so much of Clarke’s later work, the scenario is deliberately detached from an explicit political or social context and presented instead as a series of loosely connected scenes. In the opening sequence Christine (Vicky Murdock) wanders through a suburban estate to a friend’s house where that familiar staple of the ‘80s family home, the metal biscuit tin, contains not confectionary but the heroin user’s ‘works’. The two shoot up – in remarkably graphic detail – before falling into a stupor on the couch as the television blares children’s cartoons. As far as incident goes, that’s it. The remaining 45 minutes consist largely of variations on that same scene. The most striking and memorable visual feature of Christine’s narrative are the film’s numerous walking scenes, where Christine goes from house to house to make visits and to shoot up. These scenes last for anything from a few seconds to a few minutes, and are accompanied only by the diegetic sound of feet on concrete or grass. 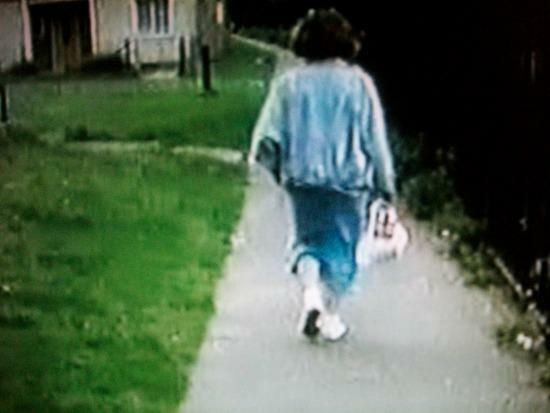 The effect is both hypnotic and disturbing; it feels like Christine could be walking forever. As the film continues, the viewer tries to familiarise themselves with landmarks and streets that vaguely recur, but the overall effect is of being lost in an endless, sprawling suburban mass. This focus on walking will come as no surprise to aficionados of Clarke’s work. Among other directors, only Bela Tarr comes close to Clarke in his fascination for long, single shots of characters traipsing from one location to another. Beginning with his psychiatric hospital drama Funny Farm (1975), Clarke developed a style based around tracking shots of characters walking around institutional corridors or urban environments. In Funny Farm, these shots are quite primitive – the camera can be seen to shake quite heavily – but by the time of Christine Clarke had mastered the use of the Steadicam, that frictionless wandering camera rig so beloved of Stanley Kubrick, and his late films are characterised most obviously by this gliding, wandering eye. Clarke’s characters don’t just walk for the sake of it, and this is important to an understanding of the way he uses walking in his late films. To walk, for Clarke, is to experience a moment of personal mobility that is nevertheless contained within a constrained or restricted life. The characters in Scum (1977) and Funny Farm have their journeys bound by the institutional corridors in which they work or are forcibly sectioned. The sectarian assassins and victims in Elephant are either on their way to kill, or on their way to die. Clarke’s films frame walking as an apparently free activity that is in fact implicitly bound by several factors – class, money, state power – that are only occasionally visible. When watching Clarke’s films, it’s easy to be reminded of the figure of the ‘flâneur’. The term, which dates back as far as the 16th century, designates a figure who strolls and idles, and who walks without any specific destination. The term was critically popularised in the 20th century by Walter Benjamin who, in a study of the work of Edgar Allan Poe and Charles Baudelaire, located the flâneur as a city-dwelling wanderer among large crowds of people. Later studies of this figure by writers such as Will Self and Iain Sinclair often use the term ‘psychogeography’ to refer to the mindset of the contemporary wanderer, and Lauren Elkin has recently explored the figure of the female ‘flâneuse’ in her book of the same name. For Benjamin, the wanderings of the flâneur were threatened by consumer capitalism; the moment when the freedom to wander the streets becomes compromised by the transformation of those streets into private zones of capital. While it might not seem obvious at first, a similar thing is happening in Christine. The film was made at the very height of Margaret Thatcher’s implementation of neoliberalism in Britain, and while the corridors of the borstal or the psychiatric hospital are absent, they have been replaced by something more insidious; the blank, interchangeable face of the British suburb. Indeed, what sets Christine apart from many ‘drugs and kids’ films of the 1980s is its focus on the middle-class. While heroin was often considered a ‘street drug’ in the 1980s, Clarke’s film uses opiate abuse to illustrate something more than what was widely regarded as an inner-city social problem. In Christine, the narcotic, trance-like effect of heroin is twinned with the directionless, disorienting space of the suburb – that Thatcherite space of aspiration – to depict a kind of zombified living death. The first time we see one of Christine’s friends he’s – inexplicably – wearing his father’s clothes, a jarring image that implicitly collapses the difference between adults and children in the world of the film. The brief conversations between Christine and her friends refer elliptically to a party that may or may not be taking place on Saturday, or Friday, or another day. These conversations are so oblique that it’s impossible to know whether the film is even unfolding in chronological order. The aspirational routines of the suburban middle-class are configured, then, as a repetitive, childlike narcotic fug. Christine’s walks give the impression of freedom – unlike Benjamin’s flâneur, who is generally part of a crowd, this flâneuse walks alone across open, unoccupied estates – but the world around her constrains and restricts her movement. She never leaves the estate, which might as well be the entire world. In Clarke’s film, middle-class aspiration is configured as merely a larger, less visible kind of cage. In a final excoriating touch, the streets on Christine’s estate are named after several British Romantic poets. While the Romantics’ creative relationship with opiates is well documented, Clarke and screenwriter Arthur Ellis satirically invoke the relative privilege afforded to those poets by their social status; drug use, of course, tends to be stigmatised most heavily when the user is socially powerless. As the film was only available in poor quality bootlegs until its official release last year, it was possible to miss many subtleties and details of Clarke’s meticulous mise-en-scene. Until last year, I’d seen the devastating final shot of the film – an extreme close-up of Christine’s expressionless face as she watches television – as an open-ended continuation of the endless cycle of constraint and emptiness that preceded it. However, I’m now convinced that in the cleaned-up version of that final shot, an almost imperceptible tear can be seen to roll down Christine’s face. While this detail might sound rather sentimental in the telling, in the context of the preceding film it is breath-taking, representing a miniscule glimpse of the emotional despair so effectively suppressed in the repetitive tasks and movements of what went before. The human cost of the environment of Christine – the suburb-as-world, the empty aspiration, the physical constraint – is made brutally clear, but this emotional reaction also indicates the possibility of awareness, of resistance, of escape. David Hering is Lecturer in English at the University of Liverpool.